Sussex skipper Ben Brown will provide a timely boost as third placed Eastbourne face second placed Brighton & Hove tomorrow (Saturday 12 noon) at The Saffrons, in the Sussex Premier League. Brown (right), who previously played for Eastbourne before joining Sussex, will be drafted into the side as Sussex embark on a period of T20 action. Brown is a regular in the County Championship and one-day format but often misses out in the T20s. 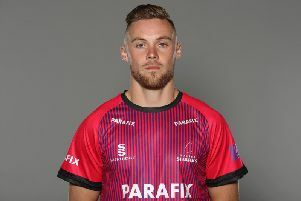 Eastbourne chairman Ian Fletcher-Price said, “I have been in contact with Ben over the course of the season and I’m delighted he can play for us against Brighton. “Sussex enter a spell of T20, which means Ben is available. We will take it on a game by game basis because the situation can change but for this Saturday, he will be an Eastbourne player once more. I can’t think of many, if any, current county captains who have played for their club side. “Full credit to Sussex. They are happy to let their players play in the Premier. It’s good for us and it’s good for the league. We have been on the receiving end of professional players playing against us a few times this season, so it’s nice that it has worked out for us this time too.” Victory against Brighton will keep Eastbourne in title contention after a fine run of five victories has seen them rise to third just behind Brighton and leaders Roffey. Eastbourne lost narrowly to Brighton in June but Smith is more confident this time.